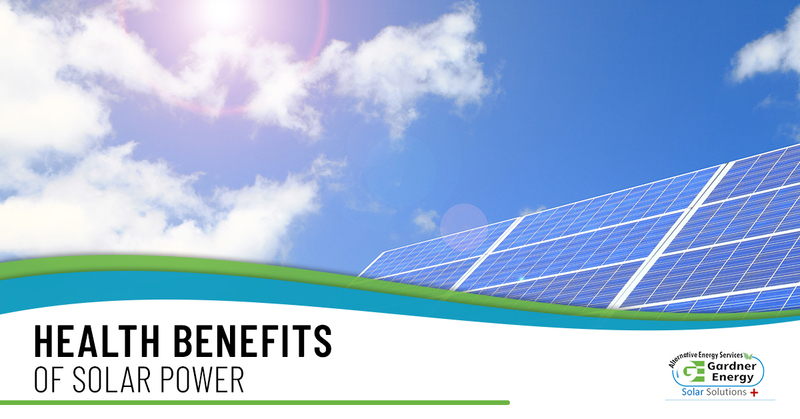 Here at Gardner Energy, we often talk about the benefits that solar power can offer you. From adding value to your home to saving you money on your utility bills, solar panel systems are a smart investment for home and business owners. While we often talk about financial incentives for installing solar panels, we haven’t discussed the health benefits of solar power much. Today’s blog will cover how alternative energy sources can improve your health in Salt Lake City. Naturally, good health starts with the health of our environment. Perhaps one of the greatest advantages of solar panels and alternative energy source systems is that they produce little in the way of air contaminants. The National Renewable Energy Laboratory found that the more solar panel systems that are adopted, the fewer air pollutants like nitrous oxide, sulfur dioxide, and other particulates are released into the air. That’s because nearly 39% of all carbon output is produced by buildings. And it doesn’t take much to make an impact. A single-family home can diminish their carbon output by three to four tons annually just by using a solar panel system. This means cleaner air, ensuring that we can all breathe a little easier. The reduced environmental impact doesn’t stop at your home. When you go solar, you reduce the strain on your local utility provider. The discharge free energy you’re utilizing from your panels means you’re not drawing power from the power plant. The result is that the utility company creates less carbon because it has fewer clients to take care of. Many power plants are still reliant on fossil fuels, so using a solar panel system reduces the number of pollutants being released from your home and the plant. All those reduced carbon emissions mean that there are fewer pollutants in the air. Those suffering from respiratory issues, like asthma, are less likely to suffer from their illnesses. Recent studies suggest that the United States could save a lot of money on health expenses if they invested more in solar power, and lessened their reliance on fossil fuels. One study suggests that nearly $167 billion in health and environmental damages could be avoided by the widespread adoption of alternative energy sources. Preserving the environment by using alternative energy sources also helps us to preserve nature. It’s a well-known fact that spending time in nature is good not only for our physical health, but our mental health as well. Even spending a few minutes outside in a natural area, or our backyards can alleviate symptoms of depression and loneliness. Since 2005, we’ve helped people all over Utah end their dependence on harmful fossil fuels and adopt alternative energy sources, like solar power. If you don’t need any more convincing and are ready to enjoy a healthier lifestyle, and a leaner utility bill, then it’s time to connect with Gardener Energy for a free estimate for solar panel installation on your home or business in Salt Lake City.